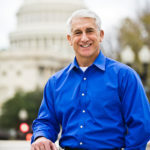 David Reichert is a politician who is currently serving his seventh term in the U.S. Representative for Washington’s 8th Congressional District. He is a Republican and a former sheriff of King County, Washington. He announced he would not run for an eighth term in 2018. "Congress has an obligation to protect our country’s natural beauty, embodied in our nation’s parks, rivers, and breathtaking landscapes." "At a family’s most difficult time, I want to make sure at a minimum that they have the very basic of comforts: the ability to grieve their loss privately and the knowledge that their country is grateful for their loved one’s sacrifice and service." "As a former cop, I respect and appreciate those who’ve dedicated their lives to serving others as well as those who appreciate the rule of law and honor it."